​Autor: Alio, J.L. ; Azar, D.T. The diversity of procedures that characterize modern refractive surgery makes it, both for the beginner and the experienced surgeon, necessary to have well established guidelines to face refractive complications. This lavishly illustrated guide is written by international opinion leaders with extensive experience in the practice of refractive surgery. 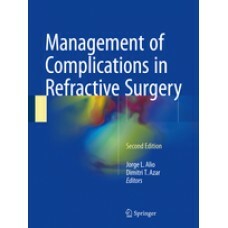 It offers the reader practical pearls to the solution and prevention of the different complications of corneal and refractive surgery. This book provides ophthalmic surgeons with appropriate solutions for the most frequent problems they would face in their daily practice. lities. Complications covered include: Intraoperative complications (e.g. those encountered during femtosecond laser, SMILE, LASIK and EPILASIK, corneal refractive surgery, refractive lens exchange, and intraocular refractive procedures); early post-operative complications and late post-operative complications.